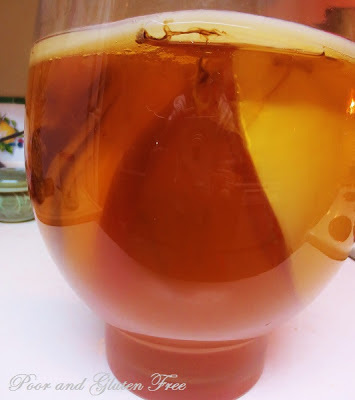 Wondering how long a Kombucha scoby can lie dormant? After writing my Kombucha Diaries from Vancouver over the summer, I made a couple of batches of flavoured Kombucha, then got caught up in wedding planning madness and headed back to Wisconsin for the fall. I thought for sure my Kombucha scoby would have shriveled up and turned to dust after sitting entirely unattended in an old yogurt container in my mother's basement for the last 6.5 months. When I came home for the holidays, I decided to crack the lid on my Kombucha and see what my scoby had been up to. When I packed up my scobies after my last batch (I had two, a mother and a baby), I followed the basic directions I'd read on some very useful sites, namely The Food Renegade, Happy Herbalist, and Kombucha Kamp. 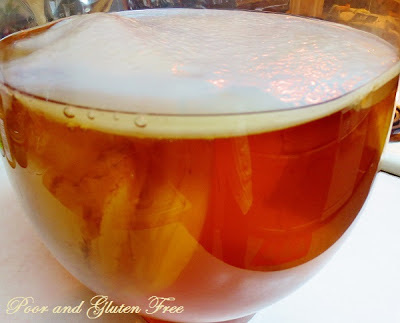 They all suggest storing your scoby in a glass or plastic container along with about 1/2 cup or so of kombucha tea. So I put my scobies in a plastic yogurt container with a lid on the floor in the basement stairwell and left it at that. I wasn't sure if I should refrigerate it or not, so to the basement it went! Now these sites all recommend periodically adding some more Kombucha tea to feed your scoby and keep it from drying out. Obviously, I didn't do this. I don't doubt that it's a good idea, it's just that I wasn't able to. When I got back home I opened my container, and lo and behold, my scobies were going strong! In fact, they had even gotten bigger! There was also a fair amount of liquid still in the container, enough to work as a starter for another batch. Although the scobies were in very good condition, I wasn't sure if they would still make a good tea. Luckily, my mother had also stored a bottle of my last batch in her basement fridge for me. That tea was flavoured with blueberries and mint. So I brewed a batch of sweetened tea and proceeded as one normally would to make Kombucha. *However, instead of just putting in one scoby and a bit of starter, I put in both hefty scobies and the whole Mason jar full of blueberry mint Kombucha. After ten days of fermenting on the kitchen floor near the heating vent (this wasn't intentional, but I don't think it hurt in this cold weather) the result was even better than any previous batch! It was wonderfully fizzy and fresh. I don't know if this is because of the blueberry mint starter, the extra scoby, being near the heater, or some mysterious miracle. Since my starter is now flavoured with blueberry and mint I guess we'll find out with the next batch if that is what made the difference. Not only that, but it rapidly grew itself a nice fat new scoby, so now I have more to share! So I don't know if this half-hazard approach is really what created such fizzy Kombucha, or if it's standard for a scoby to survive over 6 months unattended, but it definitely worked for me this time. Right now I'm "double fermenting" my Kombucha again for another day or two as I try out a couple of different flavours. Right now I've got two bottles of ginger lemon and two of pomegranate tea on the kitchen floor. I'll let you know when I crack them open how that turns out, and if they work I'll share the recipes later this week. Have you tried reviving a Scoby? How long did you leave it dormant and what was your method? Recipes for Unusual Gluten Free Pasta: Pierogis, Dumplings, Desserts and More! ? I'm so sorry to hear that! My mom's basement wasn't exactly warm, but definitely warmer than a fridge. I assume that you're also making sure all your containers/jars/hands etc are very clean? tight liuds are your problem, scoby are an aerobic culture.. they need to breathe, if you put a tight lid on the scoby your suffocating them and then when they die they mold. I have accidentally grown scobys by leaving kombucha in my son's sippy cup, abs he left it buried in a messy corner of my room for a while. Weeks? Months? Not sure. When I found it, there was a scoby growing, though. I also have had batches mildew, and I hear if you put more starter, or even acv, if you are out of starter, it will keep the mold away while you wait for the fermentation to get going strong. I an about to start working on a scoby I have left alone for way too long. Lol, funny isn't it? Some people would be grossed out to find fungus growing in an old cup, but for those who grow Kombucha it can be exciting ;) Interesting tip about the ACV, thanks for sharing, Taylor!! I've never heard of this, and would love to try. Thank you for sharing! I am preparing to make a batch after my SCOBY has been sitting on the shelf for... ready for this... three years. Yeah. It's true. When I opened the mason jar it was in it still smelled just like normal so we shall see. The only thing I would consider 'off' were the glittery floaters that were dancing around in there when I would turn it to the light. They were the same size and shape as glitter and caught the light beautifully. I've decided they are kombucha fairies. I'd rather not buy another starter if I don't need to so here goes. I don't figure I will die. Nobody dies from the kombucha fairy. Let us know how the kombucha goes, please! Wow, I had an old scoby in the fridge for like 3 years totally ignored. Same story, smelled just fine but when I tried to make a batch, scoby molded. (Maybe some of the acv would have worked). Now that scoby is a dried up disk conversation piece. 3 years is amazing! It's possible that it was perfectly preserved in the fridge but somehow got contaminated on the way to making a new batch. I have two batches of kombucha at once. Im trying to get the hang of this, I have 2 questions if you wouldnt mind helping me =) .... 1. Why does my kombucha smell like old orange juice (only fermenting for 5 days)? 2. I went to look at my 2nd batch of kombuca the scoby was sitting on the brim and out of my tea... not sure how long its been like that but this batch has been a 7 day ferment. but my scoby was dry on top. Is it still good to use? and how about the tea mixture, is that ok as well? Kombucha can have a fairly strong, vinegary scent, which may account for the old orange juice scent, especially if it's near a vent or in a warm spot. I've had kombucha brew really fast near a heating vent in winter. 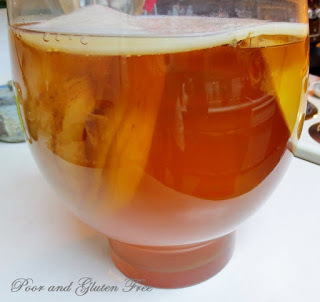 It's fine if the kombucha scoby has risen to the top and sits on the brim of the tea, that's common (if you check the above photos there's one sitting on top of the tea in the jar). If it's dry on top that should also be ok. The main thing to watch out for is if there's any type of mold or discoloration - like black/green/brown spots on the kombucha. If there's mold/fungus then personally I wouldn't drink it, as it's probably been contaminated. I'd toss the scoby and start over. I'd never heard of a scoby before this! I never knew you could grow it, it looks very useful though! I have a scoby in my fridge for a while now. I don't know how long. A few months maybe? I've gone to toss it out when cleaning out the fridge a few times, but it still smells normal and is most and has gotten bigger, so I've kept it. I've been afraid to try anything with it. This blog gives me hope. I don't have any tea left. I was thinking I might cut a piece off and try a mini batch. I figure if it grows a baby and smells OK is probably fine. I'll try to remember to post my results. Cheery o.
Hi, wonder if it is ok to use Scoby that has been refrigerated in a plastic container for more than a month? Very cool tough! never heard of this before. Such a wonderful blog. Thanks for sharing. This happened to me! I neglected my scoby for about 4-5 months over the winter. We kept our house cool. In the spring when it warmed up, I found that I had new growth on top of the old scoby. Used the new growth for a new batch and it is working great. A kombucha scoby sounds very exotic indeed! I had a scoby given to me and it has been living in my fridge for about 5 months...change of jobs for both my husband and myself ...life was crazy. I'd keep peeking at my scoby and tell it...'some day, I promise'..lol. I hadn't opened it and it came in the freezer quart Ziploc bag. Well life has calmed around here and I'm happy to say I'm just at the 72 hours mark! :) I also noticed a baby on the one I had given to me and I tossed him in with all the tea that was in the bag I am thinking the little guy was produced while in storage. I have a spigot on my glass brew gallon container and I have just tasted it...it's yummy. It's still really sweet but I could see minute bubbles..not sure if that was fermentation or just the spigot pour but I'm excited to see how the first brew goes. I will keep you posted! I just started my first batch ever in a 1 gallon carboy that I would typically use for mead brewing. It's only a few days in and the surface is starting to get murky white. I realized a problem though... The opening of this bottle is only about an inch or so. I won't be able to get the SCOBY out in a couple of weeks. Is it fine to transfer everything to a bigger container right now while it's still early or will it disturb the fermentation process? Hi Diff, I don't think it will disturb things too much and it's probably best to move it now while you still can. The murky white stuff might be a new scoby growing, so don't be surprised if it's a rather substantial, slimy thing ;) Just try to keep things as sterile as possible in the process of transferring it. ive had mine sitting forgotten for...hm...the past six or seven months. It looks okay? Do you think it'd be okay to use the starter liquid from the jar that's been sitting with the scoby for the past few months? Thanks, Danielle! I'll try it out. I really appreciate this post and your reply. I'd hate to waste everything when it all looks fine. I brewed some sweet tea and put a bit into the jar that didn't seem as dry and for the other i did the same but added equal amount of distilled white vinegar because there was no starter liquid. I didn't think to buy a bottle of kombucha and add that instead of vinegar! Did i ruin it? It's really hard to say, but using vinegar isn't quite the same, and if your scobies are dried out, there might not be any turning back. On the other hand, it could be an interesting experiment to see what happens if you give them a couple of days. Just don't use anything that looks moldy or questionable! I haven’t used my scoby for about 4 months, with it in a cup of tea in a sealed jar in the refrigerator. It looked ok, so I made a batch. It sunk to the bottom. Three days later it is standing on it’s edge. Do you think it’s ok? Thanks. I love your site.